Blanch the green beans, asparagus, broccoli. Cool quickly under cold water and dry. Separate the broccoli into bite sized pieces. Slice celery, peppers, carrots, jimica, and any other vegetables into easy to handle bite sized pieces. Peel back some of the outer leaves of the cabbage for decoration then hollow out the cabbage - a melon baller works well. 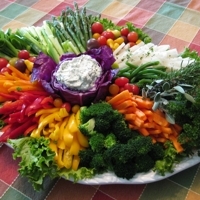 Line the platter with lettuce allowing it to overlap the ends of the platter. Place the cabbage in the center or I like off-center and an oval platter. Arrange, pile the veggies in groups around the cabbage; getting them to sort of stand up when you can...just so it looks a little more interesting then a flat wagon wheel. Fill the cabbage with your favorite dip. Tuck herb bunches on one or both diagonal sides. Sprinkle chopped parsley lightly over the top if you like. That is one healthy platter. We need those stuff too, more often i think.